Check out my latest article from the Temple News, featuring Philly’s newest vegan, gluten-free bakery. 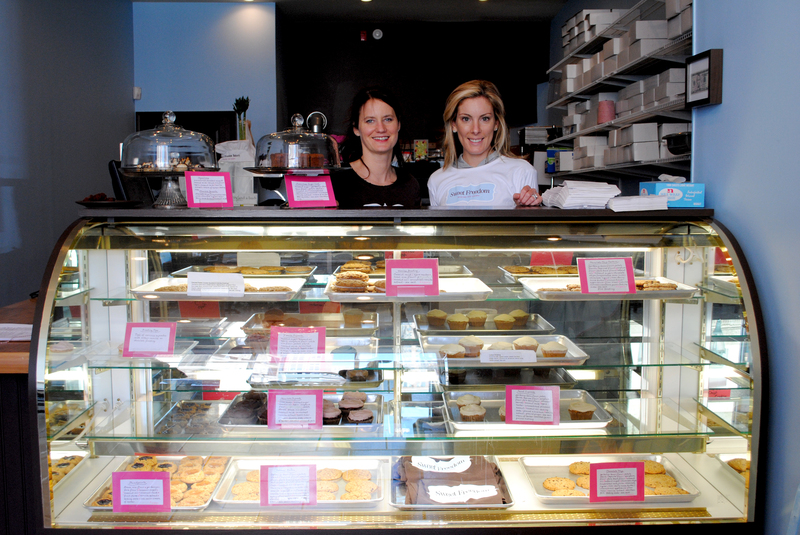 The bakery offers safe goodies for people with food allergies, who can have their cake and eat it too. Brownies without eggs, cupcakes without wheat, carrot cake without cream cheese, cookies without butter — for a baker, or just an avid eater, such a list might be unimaginable. 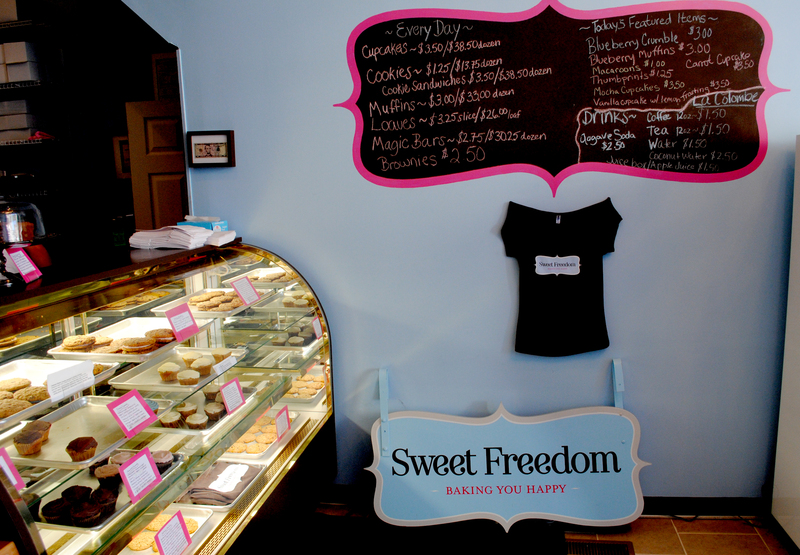 It is however, not so ludicrous for Heather Esposito and Allison Lubert, owners of Sweet Freedom Bakery, a newly opened bakery at 1424 South St.
Esposito and Lubert, both former health counselors, have created a place for all of those with various food allergies or diet restrictions. 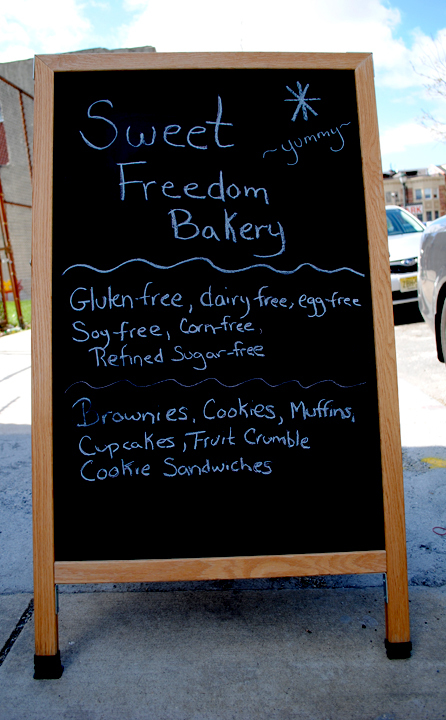 As the only gluten-free vegan bakery in Philadelphia, Sweet Freedom Bakery creates all the typical baked goods, minus all the typical staple pastry ingredients. All the South Street bakery’s creations are made without gluten, dairy, eggs, corn, wheat, peanuts, soy, casein or refined sugar. As health counselors, Esposito and Lubert also wanted to keep those with celiac disease in mind when opening Sweet Freedom. Celiac disease is an autoimmune disease that compromises the ability of those with the disease to process gluten, a protein found in all forms of wheat, as well as related grains, such as rye, barley and triticale. According to the Celiac Disease Foundation, one in 133 Americans has celiac disease. Symptoms range from bloating, diarrhea and upset stomach to infertility and fatigue. Wanting to open up a gluten-free bakery for some time, Esposito collaborated with Lubert and finally got her idea off the ground. Esposito, who lives just over the bridge in New Jersey, and Lubert, who resides in Philadelphia, said they thought Philly was the perfect city to launch the idea. But they are not the only ones in Philadelphia supporting gluten-free dining. Between the two of them, Esposito and Lubert, who said they eat a diet consisting of 80 percent to 90 percent plant-based foods, encounter a lot of food restrictions in their own diets. Lubert is allergic to wheat, cane sugar and cow’s milk and tries to stay away from soy and corn. Esposito is sensitive to gluten, lactose-intolerant and hypoglycemic, which requires she stay away from refined sugars. “Refined white sugars suppress the immune system. They age you, and they contribute to diabetes, obesity, general illness, fatigue and mood issues,” Esposito said. Coconut sugar, agave and maple syrup take the place of traditional refined sugars in Sweet Freedom’s recipes. Since none of these refined sugar substitutes are processed, they all maintain their natural vitamins and minerals. Their firsthand experience and knowledge of allergies definitely reflects in the bakery’s selections. And while the treats may lack many of the common baking ingredients, they certainly are not lacking in taste or satisfaction. 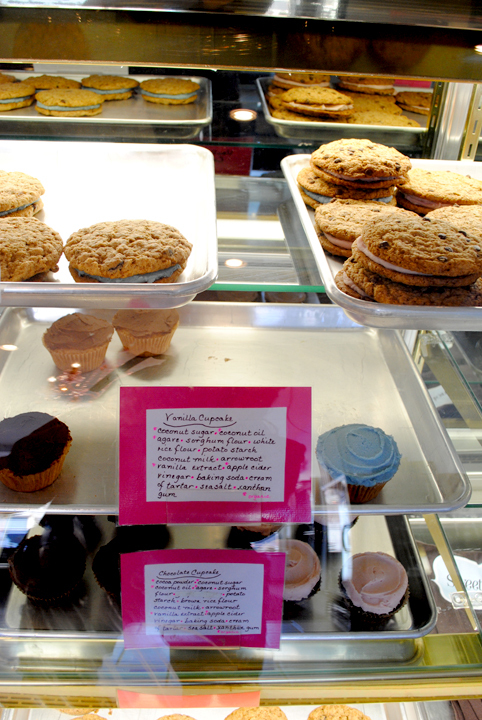 Between the wide selection of various muffins, cupcakes, cookies and other items, it is hard to know which treat to choos e. The bakery’s bestsellers are the chocolate chip cookie sandwiches, consisting of your choice of creamy vanilla or chocolate dairy-free icing, decadently sandwiched between two large chocolate chip cookies. Esposito’s favorite is the banana chocolate chip loaf, while Lubert’s favorite is the blueberry crumble. The blueberry crumble does not disappoint. It is a rich, gooey square of sweet blueberry heaven topped with the perfect touch of cinnamon-baked oats. The brownies were surprisingly tasty – extremely moist and chocolaty. Don’t let the sugar-free label confuse you; while you may want to fully gorge yourself on these treats, they are in fact still treats and contain as much fat as any standard baked good. “They aren’t low fat, but they are made with healthy fats,” Lubert said. Instead of using animal-based fats like butter and lard, Sweet Freedom Bakery uses plant-based fats, primarily in the form of coconut oil. Lubert said that these kinds of oils have more anti-inflammatory properties and are more efficiently used as energy by the body rather than just being stored as fat. “I think unfortunately when you look at the back of a box at a nutritional label, it will say so many grams of fat, but it doesn’t go as far to say the quality of that fat. We’re more about the quality of ingredients than necessarily counting [grams],” Lubert said. By eliminating unrefined sugars, the owners have also helped to make their baked goods healthier options. wow, looks like a great place for an after-dinner (or lunch!) dessert! What a great idea! Too bad I don’t live in Philadelphia. I love baking traditional foods with better ingredients. Recently I made brownies with black beans instead of flour and dates instead of sugar. They were delicious. wow this sounds AWESOME! i so wish we had somewhere like that here! This looks like a great bakery for someone like me who has PCOS and needs to watch their sugar intake. What an amazing sounding place!!! There need to be more bakeries like this! So glad to hear there is a place like this in Philly. My sister just told me there is a great gluten free bakery near her in Baltimore. As for sprouts, which I do love, they are on the list of foods to use caution with because of their link for food borne illness. I think it has to do with the shape and that it is easy to trap bacteria. Washing well will certainly help. This is why you will notice that many places do no carry sprouts. It is definitely on the list of consume at your own risk, just like sushi would be. I have not heard of any sprout related outbreaks recently, but this is one thing that has been linked in the past with foodborne illness. This is so wonderful! People have such different needs when it comes to dietary restrictions and it makes living a healthy, happy, balanced life so much more doable when there’s places like this bakery to ease people into their new lifestyle and show them that restrictions are unmanageable!